3 Easy Steps & only 30 Seconds Hands-on! 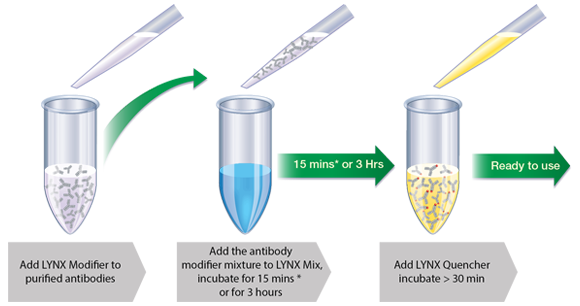 LYNX Rapid & Rapid Plus Conjugation Kits have made the direct labeling of antibodies, proteins and peptides so quick and easy. It only takes 3 simple steps, with 30 seconds hands-on time, to obtain high quality and covalently conjugated antibodies. 3 Easy Steps, only 30 Seconds Hands-on, 100% Yields of Labeled Antibodies! 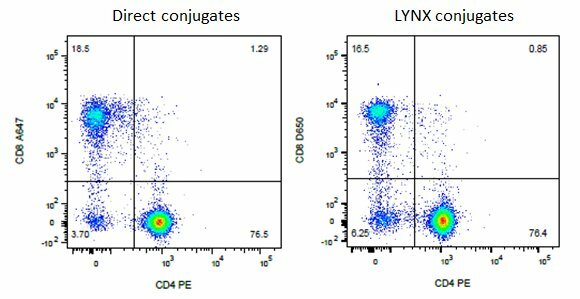 LYNX conjugation kits allow you to label your primary antibody quickly and easily avoiding the use of secondary antibodies with a level of fluorescence you can trust. As can be seen below, where human peripheral blood has been stained, the conjugation kits match the performance of our standard directly conjugated antibodies. Fig 1. Purified CD4 (MCA1267) and CD8 (MCA1226) were labeled with LNK021RPE and LNK241D650 respectively, and used to stain human peripheral blood. Alternatively directly labeled antibodies were used. The staining shown is lymphocytes gated on the CD3 positive population. CD4 and CD8 positive T cells can be identified in both plots. Our full range of LYNX Rapid and Rapid Plus Kits are shown below. We can conjugate bulk antibodies with your choice of labels for you. Our antibody conjugation service is available for custom conjugations of your antibodies, either from your labs or antibodies that we have created for you as part of a custom project, or if you are simply looking for a new conjugate for one of our catalog antibodies. LYNX Rapid Conjugation Kit® is a registered trademark of Bio-Rad Laboratories, Inc. Cy containing products or portions thereof are manufactured under licence from Carnegie Mellon University under U.S. Patent Number 5,268,486 and related patents. Cy® and CyDye® are trademarks of GE Healthcare Limited. Texas Red® is a registered trademark of Molecular Probes, Inc. Dylight® is a registered trademark of Thermo Fisher Scientific and its subsidiaries.